Every household in Greece makes an enormous pile of melomakarona during Christmas. Nowadays, many people prepare them ahead, starting in November. They are such a great treat for a hot cup of coffee or tea. How can you resist melomakarona or kourambiedes? This traditional Greek recipe makes crunchy cookies soaked in honey syrup. As a result, the melomakarona turn out oozy,aromatic and extremely drooling cookies. Melomakarona loves their spices. Cinnamon and a dash of clover are essential. 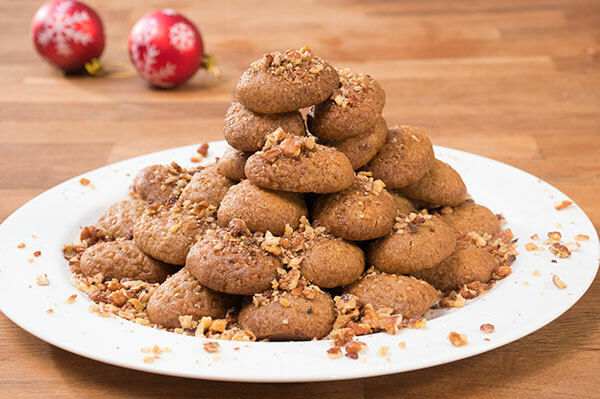 Some adventurous cooks will opt for cardamom and ginger, providing an Earthy taste to this already delicious Greek Christmas cookie. Now, for the oil part, I always use half vegetable oil, half olive oil. 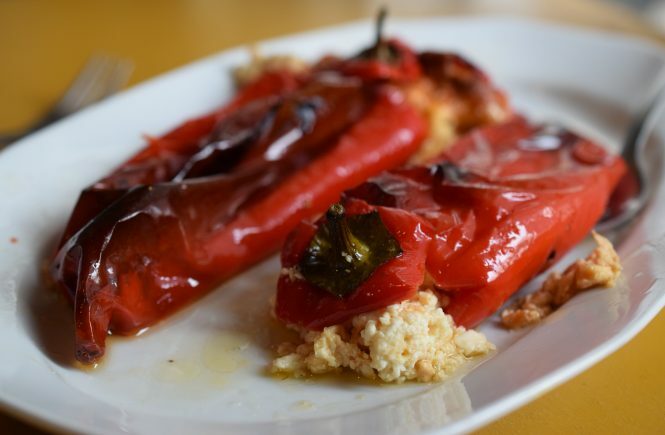 As much as Greeks adore using olive oil to every recipe, it tends to give a distinct intense and tangy taste. This half and half mixture achieves a balanced flavor to the cookie base. The challenge to every melomakarona recipe is not over-mixing the dough. Too much kneading will cause the separation of oils, and there is no turning back after this point. Your melomakarona will not be easy to shape and most likely, they will spread unevenly while baking. Always mix this batter with your hands. You will have a much better sense as to when the ingredients are well blended. Melomakarona need a whopping 30 minutes until crisp and golden brown. You want tough neither soggy cookies. Don’t forget that soaking them in syrup will further soften them in time. Last but not least, people always go the extra mile with their syrup. This results to muddy, extremely soft and crumbly melomakarona. The secret is to prepare the syrup several hours, even a day, ahead. Dip the oven hot melomakarona, one by one, in the cold syrup for ten seconds, if you want a great texture that lasts for days. As always, you can find my recipe in the video below. 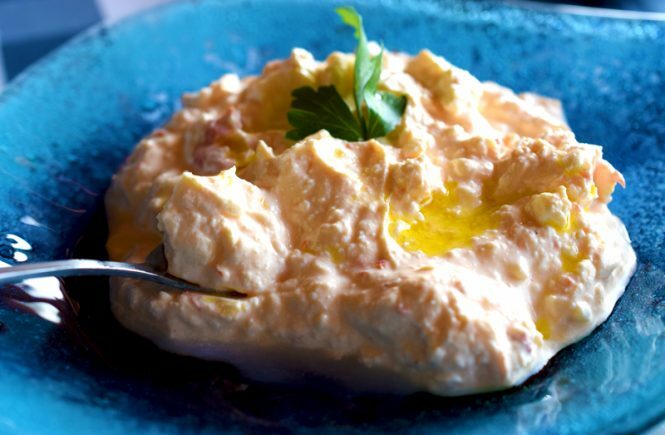 Subscribe to my YouTube channel for more delicious Greek videos and let me know what recipes you’d like me to make for you! 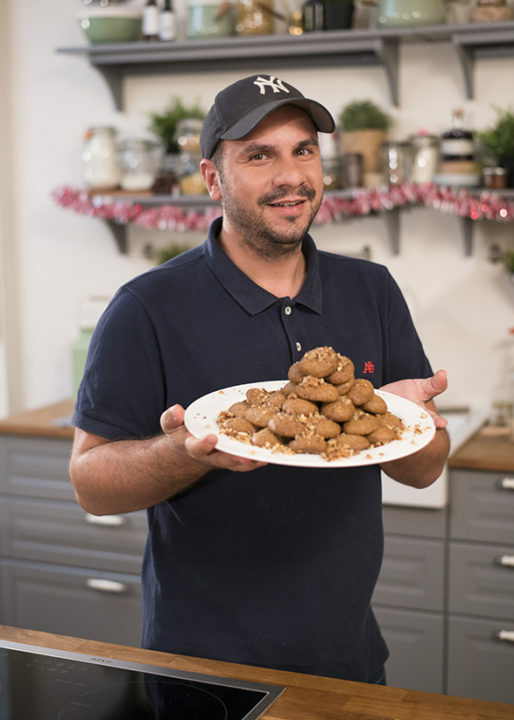 Melomakarona recipe, the traditional Greek Christmas cookies soaked in honey and syrup! In a large pot, heat water, sugar, orange slice and honey. Allow to boil for three minutes after it starts simmering. Remove from heat. Stir well and allow to completely cool down in room temperature. Preheat the oven to 320oF / 160oC. In a large bowl, combine the olive oil, maize oil, brandy, sugar, cinnamon, clover, orange zest. In a cup, mix the baking soda with the orange juice. Add to the oil mixture. Sift the flour with the baking powder into the mixture. Mix using your hands, until all ingredients are blended, for about 2-3 minutes. The final mixture should be soft and beautifully incorporated. Pull off a medium sized piece of dough and shape it into an oval cookie using your hands. Gently press the cookie on a grater to form a pattern on it. Place each cookie on a baking sheet lined with parchment paper. Leave a few inches space among the cookies as they will double in size in the oven. Keep shaping and flattening the cookies until all dough is used up. Bake for 25 minutes, until golden brown and crispy. While the melomakarona are still hot, soak them in the syrup. 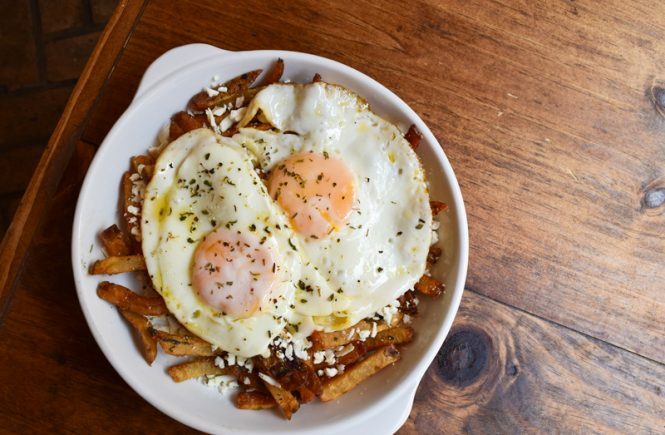 Using a deep-fry skimmer, soak one melomakarono at a time in the cold syrup for 10 seconds. Please on a wire rack and allow to rest and soak the syrup, for at least one hour. Serve the melomakarona on a platter. Garnish with crushed walnuts. My melomakarona fall apart easily. Any suggestions?